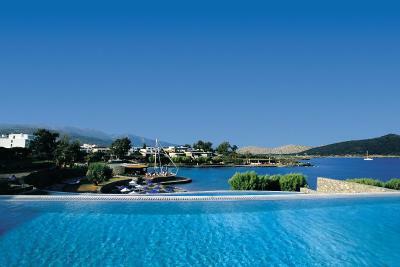 Lock in a great price for Elounda Bay Palace, a Member of the Leading Hotels of the World – rated 8.8 by recent guests! The staff was amazing! Always friendly and welcoming. The restaurant staff was especially nice and remembered your preferences every morning. The activities at the hotel were great. The beaches and food were v good.The staff were very attentive. We were a family of five booked two rooms, and to our amazement we were upgraded to the penthouse at check in. The bar staff at the pool were very helpful and friendly. The house keeping staff were also lovely. 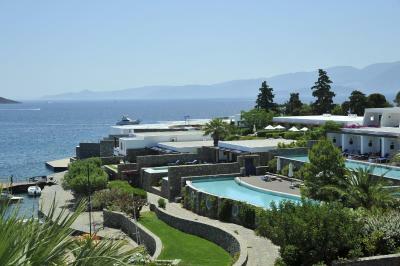 Loved the pool and beach, the views are incredible and the hotel was extremely clean. Most of the staff were friendly and gave great service. The sunbeds were very comfortable. 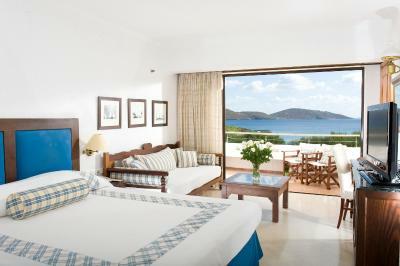 Elounda Bay Palace, a Member of the Leading Hotels of the World This rating is a reflection of how the property compares to the industry standard when it comes to price, facilities and services available. It's based on a self-evaluation by the property. Use this rating to help choose your stay! 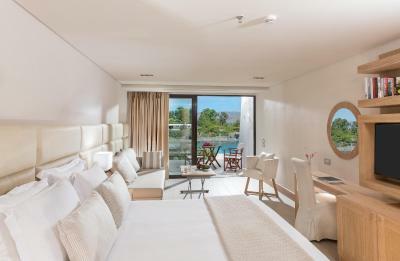 One of our top picks in Elounda.This modern 5-star hotel is surrounded by acres of gardens, overlooking the Mirabello Bay, just minutes from beaches and the fishing village of Elounda. 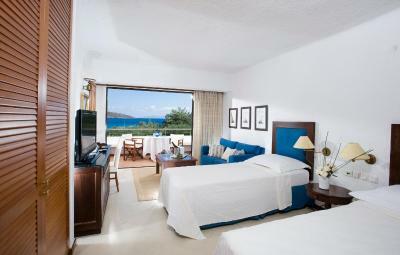 Elounda Bay Palace Hotel provides a variety of large, comfortably furnished and designed guest rooms. Some rooms have patios with direct access to the pool and others have fireplaces. Guests enjoy dining outdoors while taking in views of the pool and panoramic sea views of Mirabello Bay. The hotel’s Thalassa Waterfront Restaurant serves a variety of seafood delicacies and its Aretoussa Restaurant specializes in Greek and international cuisine. 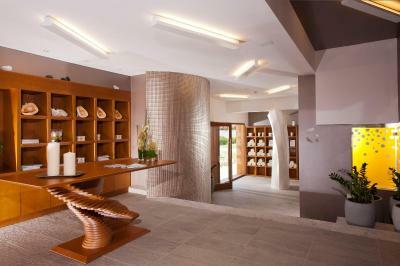 Elounda Bay Palace offers a variety of beauty treatments. 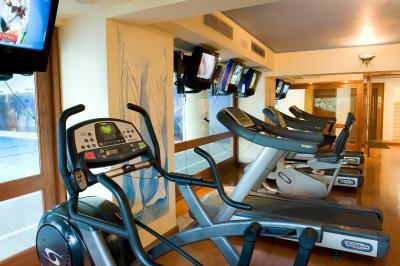 Facilities include a fitness center, a tennis court, an indoor and outdoor swimming pool, and a free parking area. 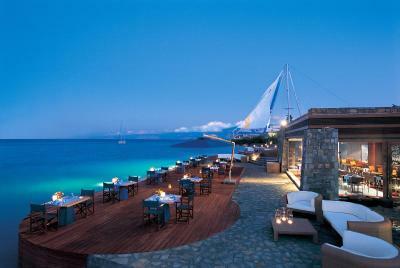 When would you like to stay at Elounda Bay Palace, a Member of the Leading Hotels of the World? 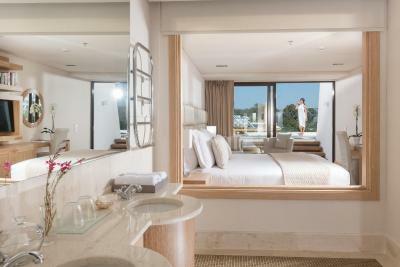 Located in the main building, the Deluxe Room offers a marble-lined bathroom and a private balcony with views of the sea. 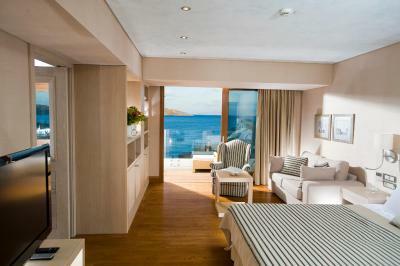 All rooms at Elounda Bay Palace are available on Half Board basis. 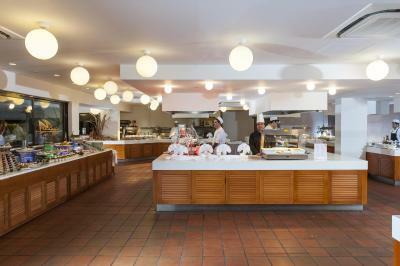 Half Board offers rich American Breakfast & Dinner buffet served in the hotel’s Main Restaurant “Aretoussa” (excluding beverages). Alternatively, a Dinner credit voucher of €30 per adult & €20 per child (3-14) will be granted per day, nontransferable to be used against dinner, in all the resort a la carte restaurants (excluding beverages). 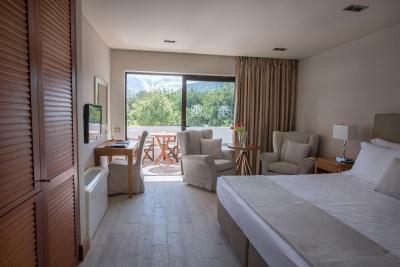 Offering a bedroom and a separate or open-plan living room, this suite features one or two private bathrooms with a TV, spa bath, separate shower cabin, while some have a steam bath and gym modern equipment. 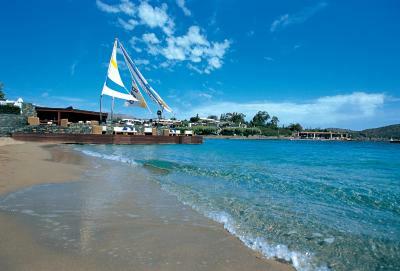 It opens to a private balcony and offers views of Mirabello Bay. The airy bedroom has a Queen-size bed and a lavish, marble-lined bathroom. 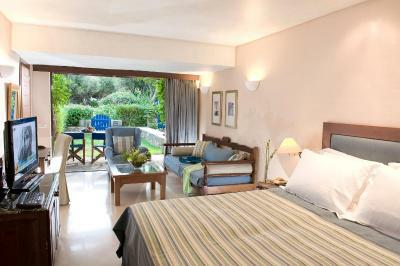 The bungalow opens to a private terrace overlooking the swimming pool (shared by 7 bungalows) and the Cretan Sea. Please note that the pool can be heated upon request for an additional charge. -Alternatively, a credit of €25 per adult and €15 per child (3-14 years) for dinner, nontransferable and valid in all a la carte restaurants of the resort, for food items. These stylishly revamped bungalows compose of a well-appointed bedroom with a Queen-size bed and sofa that lead out on to a balcony or terrace or terraced lawn with breath-taking views of the bay. 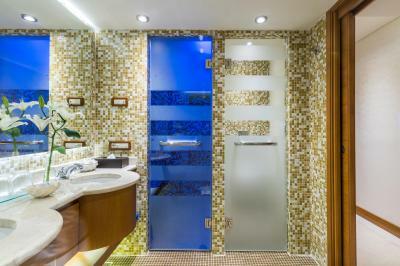 The remodeled bathrooms all feature shower cabins, while some also include bathtubs. 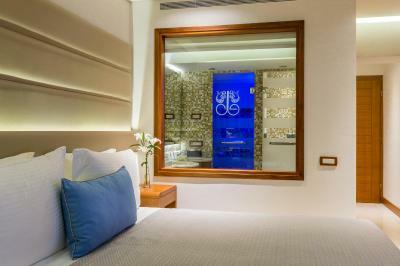 Upon request, families are provided with connecting accommodations in Deluxe Bungalows Sea View. Space, a convenient layout, luxury facilities and an enticing view that brings nature to your private lodgings are only some of the attributes of this accommodations. 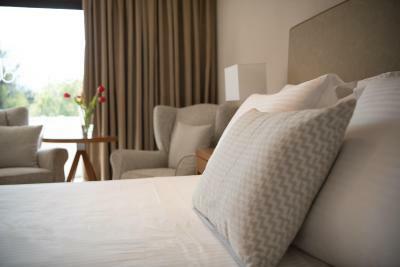 The suite is composed of a generously sized bedroom with a King-sized bed, and includes a single sofa bed, an elegant open-plan living room, a large, modern bathroom (some suites have two bathrooms), as well as a WC with a shower. 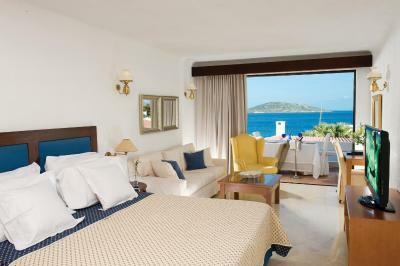 Directly overlooking the sea and located right above it, these villas are composed of an elegant bedroom with a separate living room stylishly decorated in warm and calming Mediterranean tones. 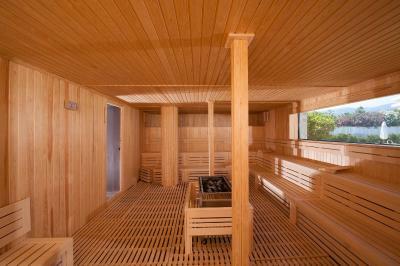 The bathroom offers a spa bath, TV and separate shower cabin. 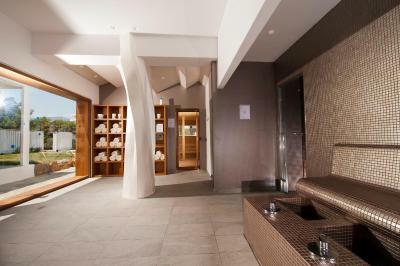 The Villa has a large veranda and offers exclusive access to a private pool. 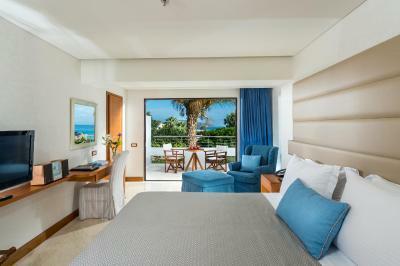 This stylishly furnished offers a side view of the Cretan Sea. 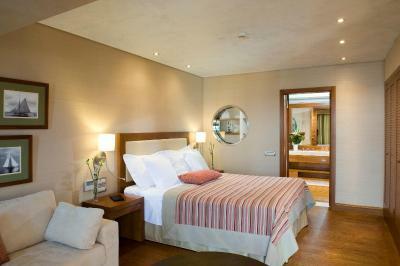 It consists of a bedroom with a twin or Queen-sized platform bed, marble-lined bathroom and a private balcony. 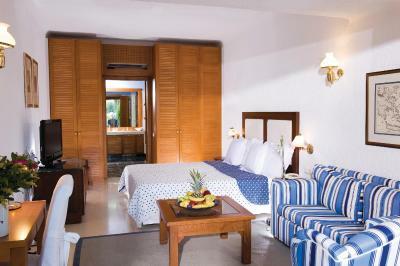 Offering partial views to the Cretan Sea, this air-conditioned room opens to a balcony or a patio. 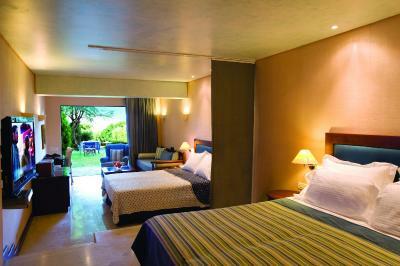 It offers a flat-screen TV with satellite channels. 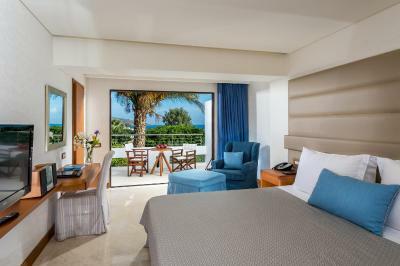 This accommodations is available in the Elounda building and is composed of one bedroom, a separate living room, which can be used as second bedroom, and one bathroom, accessible from both bedroom and living room, with a TV, Jacuzzi bathtub and a separate shower cabin, some of which have a steam bath feature. The comfort of the suites pours onto an exquisite private balcony with a sitting area. Special features include WiFi and a CD system. 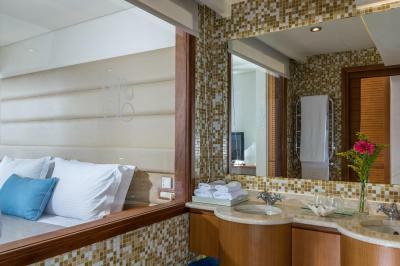 This spacious accommodations is composed of 2 bedrooms with a queen bed and 2 single beds and 2 marble – lined bathrooms. The comfort of the room pours onto an exquisite private balcony with mountain views. There is also the option of adding a single sofa bed. These bungalows are composed of a bedroom with a Queen-size bed, an open-plan living room designed with a marbled-lined bathroom with a bathtub and some have a separate shower cabin. The superior bungalow accommodations has a veranda with a patio and is located in the picturesque garden area close to the swimming pool. Upon request, families are provided with connecting accommodations in Side Sea View Bungalows. The Superior Bungalows set on the second or third row provides the perfect complement to guests with families that would like to share the pool. It is composed of one bedroom with a concrete platform Queen-size bed and a marble-lined bathroom with a separate shower cabin. 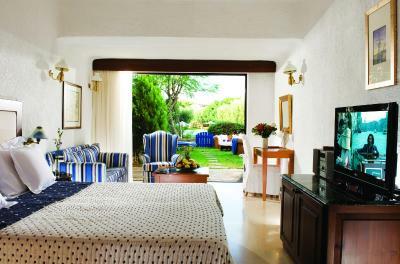 Its spacious private terrace leads to a pool shared with either two or three other bungalows. Special features include CD system. 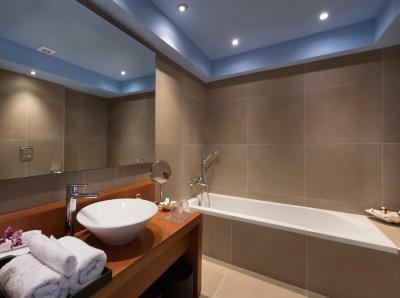 House Rules Elounda Bay Palace, a Member of the Leading Hotels of the World takes special requests – add in the next step! Elounda Bay Palace, a Member of the Leading Hotels of the World accepts these cards and reserves the right to temporarily hold an amount prior to arrival. Kindly note that the dress code required in the hotel’s restaurants during the evenings is smart casual, with long trousers for gentlemen. Please note the half-board rates include an American Breakfast and a dinner buffet served in the hotel’s main restaurant “Aretoussa” (excluding beverages). Alternatively, a nontransferable dinner credit voucher will be granted per day, to be used in all the resort's a la carte restaurants (excluding beverages). 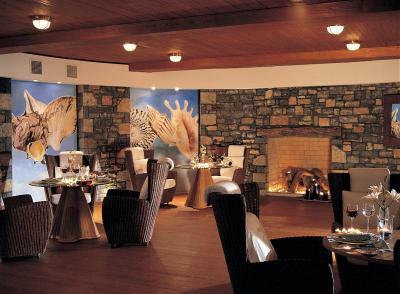 Please inform Elounda Bay Palace, a Member of the Leading Hotels of the World of your expected arrival time in advance. You can use the Special Requests box when booking, or contact the property directly using the contact details in your confirmation.